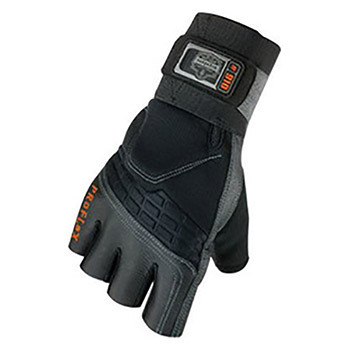 Ergodyne ProFlex 9012 2X Black Certified Vibration Reducing Gloves made of patent pending Nu2O2 polymer reduces stress of bulk to the hand and offers immense protection from shock and impact. Neoprene knuckle padded gloves featuring pigskin leather palm and fingers provides long lasting wear with enhanced protection. Woven elastic cuff gloves with full finger pattern features a low profile closure and pull on tab for quick and easy on and off. Gloves featuring in built wrist which support with patented Open Center Stay. EN 420, EN 388: 3122 certified gloves with anti odor treatment find application in demolition, deburring, mining, riveting, grinding, fabrication, heavy construction and in oil or gas refining.